Are you applying for a Railcard, and are looking for the best place to obtain your photograph? Then come to Reload Internet in Paddington, London! We can produce your Railcard photo instantly here in-store, and can provide you with a digital or physical copy for your application! We are a professional visa, ID and passport photo studio that has been operating in Paddington for well over a decade, and our outstanding customer service record shows how successful and reliable our service is! We aim to have our customers photographs ready within 10 minutes of their arrival here at Reload Internet, and can produce your Railcard photo instantly! There’s no need for an appointment! 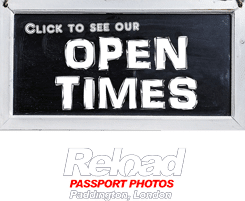 We have a team of experienced staff that will be happy to assist you upon your arrival at our store here in Paddington, and will take care of all of the requirements of your photograph so that you can leave confident in the knowledge that your Railcard photo will pass. Our store is located on Praed Street, the same street as Paddington tube and train stations, and stays open 7 days a week from early morning until late evening allowing you to come and visit us at a time that suits you! When you obtain your Railcard photo from Reload Internet, we offer an unbeatable service for the low price of just £9.99, that leaves our customers happy and secure in the knowledge that their photograph will not face rejection. We will capture your photograph using the correct background and lighting required, and will check with your after we have captured your image to ensure that your are happy with the outcome. Once we have confirmed this, we will cross-check your image with the official requirements to ensure that it will pass. Afterwards we will either print and cut your photographs if you would prefer a physical copy, or crop and edit your photograph if you prefer a digital copy. Both come with a 100% guarantee to be accepted with your application, so there is no good reason to visit anywhere else! 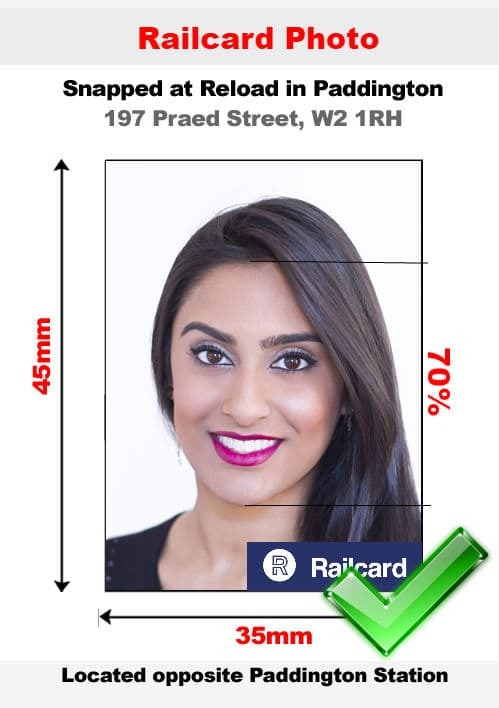 Your Railcard photograph must meet the exact specifications listed below, otherwise it will be rejected when you attempt to submit it with your application, costing you excessive amounts of time and money. Visit Reload Internet to get your Railcard photo done correctly the first time round! Your photograph must be sized 4.5cm x 3.5cm with 70% of the photograph being covered by the applicant’s head. When printed the measurement from the bottom of the applicant’s chin to the top of their forehead must be ~31mm. We recommend that you remove your glasses to ensure that they will pass, reflections and glare from the lenses, as well as frames obscuring facial features, can cause your photograph to fail. Photographs should be printed on high-quality photo paper with a minimum DPI of 300. Your Railcard photo must meet all of the requirements listed above, or it will be rejected when you attempt to submit it. Visit Reload Internet, and we can 100% guarantee that your photograph will pass first time! Our requirements are taken from the official Railcard website, which can be found here.